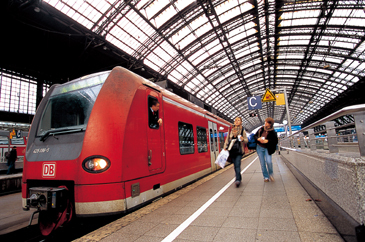 For many, a train tour in Europe, either with a Eurail card or an Interrail ticket is a dream. First of all, when travelling for such long periods, travel light! You are neither going to a party nor to a job interview or a comfortable nor a luxurious vacation. Roaming Europe with such tickets require travelling light, but still having all you need in a one-piece luggage. Buy your food and drink at a grocery store before you board the train, not to go bankrupt eating in the wagon restaurants each time you feel hungry. Occasionally, you may taste the splendid meals of a wagon restaurant and enjoy their glamorous milieu. Eurail tickets are first class and you run mostly into "stiff" passengers, whilst Interrail tickets are second class and you can expect more "sociable" fellow passengers. Exceptions do occur, as always in life. - "Yes, I do" I replied. - "Well, you have been sitting here at the same table with us, for half an hour and you haven't said a single word to us. This is kind of impolite. One can exchange at least a few words!" - "I am sorry," I said, "Of course, I would love to talk with you, but I didn't like to disturb you. This is why I kept quiet." - "No, you won't disturb us" the other explained, "You can talk with us." I explained that I lived in Sweden, though I am a Canadian of Turkish origin myself and in Sweden people don't easily talk to one another just because they are sitting at the same table. - "We are both social workers in Madrid" one explained. "You know what, we thought of the same, that perhaps you live in northern Europe and this is why you are so reserved." It didn't take long to enter into a heated conversation with these ladies all the way to Barcelona. We exchanged names, addresses and phone numbers and departed as good friends. One feels the difference between "transportation" and "travelling" after such nice social encounters! Again in Spain, travelling in a couchette car, from Malaga to Barcelona, two men in civilian clothes knocked on the glass of the compartment door. One was showing something like a jewel in his hand. I thought they were salesmen and having been waked up so early in the morning, I waved them "go away!" with my hand. The other passengers were still sleeping. They insisted knocking on and shouted, "Police!" I thought the police in the U.S.A had such badges, but didn't think in Spain they had too. Mostly European police have ID cards. Madrid, Barcelona, Malaga and Benidorm are four places I visited in Spain, a week each, and their memories will last me a life time. A vacation in Europe must have Spain in its agenda. Spain is a tourist paradise. hundreds of francs for a hotel room. Whenever I needed, I went to the station to change my shirt and fill up some cash from my "wealth" which I kept together with my passport and ticket, in my luggage which I left in the box. This way, I had an incredibly low-cost week in Nice. In the mornings, I used to go into one of the plush hotels on The Promenade and shave in its gent's room and then continue with my life at the beach. As the days rolled by, I felt quite satisfied with my sleeping on the deck-chairs on The Promenade and I didn't really feel the need to search for a hotel room, which are not only so expensive, but are also quite scarce during the peak holiday season. One can not do this anymore, as they replaced the deck chairs with wooden armchairs and one can not sleep on them. as I boarded the train, I noticed that they have packed six passengers into one couchette compartment , and all other couchette compartments were locked up with no passengers in them. I asked the conductor why they "pack-in" all the passengers into one compartment when the remaining compartments are all empty and if he could open one or two more compartments, so we could travel more comfortably. He said it was the computer which made the bookings so and he couldn't open any other compartment. But, he recommended me to take a sleeping car, paying a little extra, if I wanted to travel more comfortably, which I did. I went to the adjacent wagon which was a sleeping car, and paid a little extra and had a gorgeous sleep in the very comfortable sleeping car, until my arrival at Paris. Just before the arrival, the steward brought in fresh coffee and croissants to provide for the zest one needs to start a hectic day in Paris. Even during the peak season, one can find a berth in a sleeping car from Nice to Paris easily, as most tourists take the fast day trains. ASKIN OZCAN is the author of WISDOM IN SMILE, THE SECOND VENICE, STOCKHOLM STORIES, SMALL MIRACLES, LIGHTNING AND A BOUQUET OF ROSES, and THE MINI-SUBMARINE. Christians, Muslims, Jews -- Stop Fighting! Come Naked, Wear All You Can, No Charge! Askin Ozcan is an author of six books published in the USA. Small Miracles, The Second Venice, Wisdom in Smile, Stockholm Stories, Lightning and a Bouque of Roses, The Mini-Submarine. all are available at 200 internet bookshops globally including www.amazon.com, www.bn.com, www.alibris.com and via 25.000 bookstores giving the ISBN of the books.